Most of my yeast doughs are made using regular active dry yeast. 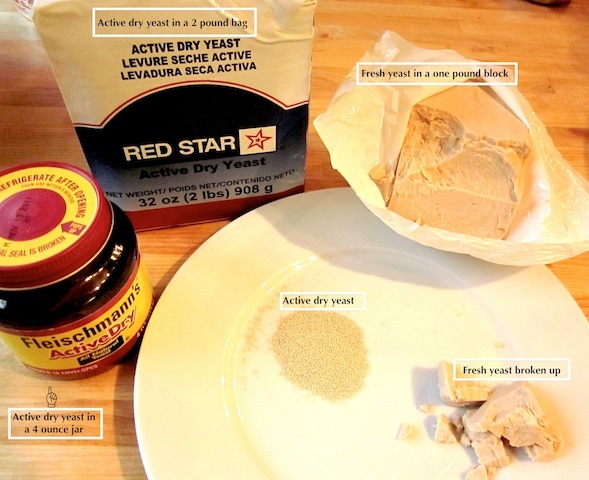 It is quite inexpensive when purchased in one or two pound vacuum packed bags (see Red Star Yeast below) and lasts a long time. When I open a new bag, I transfer a portion to a recycled 4 oz. yeast jar for easier handling. The rest of the yeast, in its original container, goes into a plastic bag sealed with a twist tie. I store the jar and bag in the fridge. It lasts quite a long time, but if you see your dough taking longer and longer to rise, it may be time for a new purchase. Even if the bag is only half used, it's still cheaper than buying in small quantities. However, I probably use more yeast than the average person. Today's article, however is on using fresh yeast, which I'll refer to as either fresh or compressed. Unfortunately, it may be difficult for many to purchase good quality fresh compressed yeast, which has a very short shelf life. The kind that used to be available in the grocery stores (in my area) in one or two-ounce little foil blocks have just about disappeared and they weren't very good to begin with. This yeast is not the same as commercially available block fresh yeast which doesn't have added starch. I believe they added starch to grocery store yeast so that it could be proofed with the addition of just warm water -no added sugar or flour necessary. Of course, the yeast needs food, but you can add that yourself when you're ready to use it. 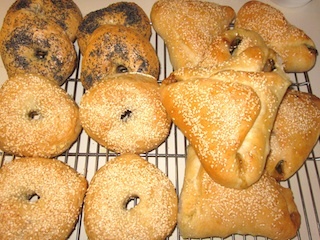 The yeast used to make the dough for the bagels and spinach bread seen in the pictures here is commercial compressed yeast, sometimes referred to as wet or fresh yeast. It comes in one-pound blocks, needs to be kept refrigerated, and is relatively inexpensive if you do enough baking to use the majority of it before it goes bad. It can be difficult to ascertain the freshness when purchased in loose blocks, unlike a bakery or pizza place that may purchase a case. When fresh, the yeast should have a pleasant yeasty odor, and not foul or moldy. It shouldn't be dry on the surface, but that is hard to tell because it is wrapped as you see in the picture. I get mine from a cash and carry supply store that sells wholesale and retail food supplies. You may have some luck trying to purchase it from a bakery or pizza place too. Here's an online source, but it's very expensive. I purchase it for under $2.00 a pound locally. Now I'll get to the part of why you would want to bother using fresh yeast. When it is truly fresh, it is the best and easiest stuff to use! I would recommend weighing the yeast, because unlike active dry yeast, which can be accurately measured by volume (with teaspoons, etc. ), fresh yeast is crumbly and can only be measured approximately by volume. When substituting fresh for dry, I use about 1 oz. of compressed yeast in exchange for 1 tablespoon active dry yeast or .3 oz. fresh for one teaspoon dry. One ounce of the compressed yeast is about 1/4 cup fresh, compressed yeast, loosely crumbled. The real advantage in using the fresh yeast is that for most bread and pizza doughs, you don't need to dissolve or soften the yeast first. Just lightly crumble the yeast and add directly to the flour before adding your liquids, etc. That saves you a step and eliminates dirtying another bowl or cup for dissolving (softening) the yeast. This yeast is very alive and not dried out into little grains that need to be brought back to life. Combine all ingredients in a large mixer bowl and mix on speed one with a dough hook until the dough is formed. Continue to mix for 10 minutes more. You need a large stand mixer for this size batch, of at at least a 6 qt. capacity. For hand kneading, just mix the dough by hand until the ingredients all come together and then knead for about 6-8 minutes. You can view my pizza dough video to see the hand kneading method in action. Allow the dough to rest in the bowl for 15-20 minutes, covered. Round the dough and cover again, allowing it to rise until double. This should take about 45 minutes to an hour and a half depending on your room temperature and the temperature of the dough. (see, How long does it take for the dough to rise?). 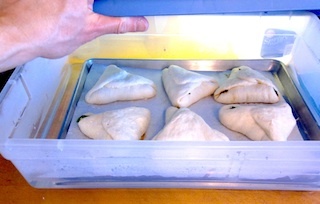 The dough can now be divided and made into your desired products. 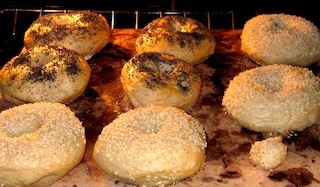 Here is my bagel recipe and here is my Spinach Bread recipe. 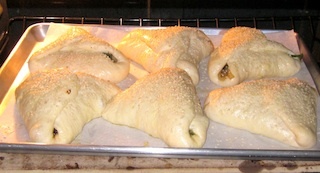 The spinach bread shown on this page are quite large. I used 4 oz. of dough for each! When I used to work serving on the bakery counter of a well known supermarket in the UK, we would sell yeast by the ounce, but it wasn't publicised, you had to know to ask. Don't know if they still do that. That's interesting. I one time got some from a pizza place in an emergency. I used to own a bakery and usually more around the holidays people would ask for it. We would sell it to them. We weighed it out accurately for them. My store help never really knew what to charge for it, so we practically gave it away. We bought a case a week which was 24 pounds. I owned the bakery and the only thing that I did not do was bake. Now that I sold the bakery, I am baking a lot. My husband is still a baker, but cannot bake on a small scale. I loved your recipes. Thanks for sharing your story. Maybe it's time to open another bakery!